While many citizens are rightfully concerned about (i) the IRS “targeting” of conservative groups, (ii) the federal government capturing “metadata,” (iii) the NSA capturing all of our web searches and emails, and, yes, (iv) listening in on Verizon and other domestic phone calls, these invasions of personal privacy are merely a symptom of a much larger problem. As I watched the Congressional hearings on “Fast and Furious,” Benghazi, and the IRS “Targeting” of conservative groups, I saw a disturbing trend developing. We may not be seeing just isolated cases of government incompetence; we may be looking at the most significant constitutional crisis since the Civil War. Part of the foundation of our Republic is the Separation of Powers among the Executive, Legislative and Judicial branches. The Separation of Powers suggests that each of the three branches has significant and important “powers.” The Legislative Branch has the power of the “purse,” among others, meaning control of the budget and treasury. The Judicial Branch has the “power” to decide the constitutionality of laws passed by Congress and actions taken by the Executive Branch. The Executive Branch has among its powers that of deciding how to implement the laws passed by Congress and of overseeing the spending of the budget. The actions of the Executive Branch today, however, appear to be actively undermining the Separation of Powers, and thereby our Constitution itself, as well as our citizens’ individual liberty and freedom. In his state of the Union Speech in 2010, the President publicly criticized a ruling by the Supreme Court concerning campaign finance. That is his right, regardless of the fact that his criticism was wrong. However, that is not the same as what happened when the Executive Branch, in the form of the Justice Department, refused in 2012 to cooperate with Arizona’s attempts to catch illegal immigrants within its borders. The Supreme Court ruled as recently as Monday, June 25, 2012, to let stand a provision that lets police check a person’s immigration status while enforcing other laws if there exists “reasonable suspicion” that the person is in the United States illegally. The very next day the Obama Administration notified the Arizona Governor that the federal government would not become a willing partner in the state of Arizona’s efforts to arrest undocumented people and would in effect ignore the ruling of the Supreme Court. If they can do that, why even have a Supreme Court ruling? Where is the separation of powers if one branch can ignore the powers of another? The situation is steadily worsening. Repeatedly, the Executive Branch is showing complete contempt not just for Congress but for our Constitution and the rule of law. U.S. Attorney General Eric Holder has been proven to have lied about the details of “Fast and Furious”–indeed, has even been held in “Contempt of Congress”–and nothing happened to him. IRS Chief Douglas Schulman, when questioned about his 157 visits to the White House, said that he was there for the “Easter Egg Hunt.” FBI Director Robert Mueller was called before Congress to testify about his investigation of the IRS “Targeting” and showed up basically to say that he knew nothing about his own agency’s investigation. Certainly this shows personal contempt, and that is bad enough. However, the recent controversy with IRS Administrator Lois Lerner refusing to testify in Congress exposed some much more troubling facts. The reason Mr. Holder, and now Ms. Lerner, are not concerned about being held in Contempt of Congress is the flawed process that Congress must use to exercise its power. In order for someone to suffer any “real” consequence from being held in Contempt of Congress, the Justice Department, led by Eric Holder, must agree to take the case to Federal Court in the District of Columbia and win a conviction. What are the chances of the Justice Department taking its own AG to court in the District of Columbia? Or even Lois Lerner? Here, as in Arizona, the Executive Branch is essentially arbitrarily deciding what laws it will or will not enforce. So it is not surprising that Congress is reluctant to ask for a special prosecutor to investigate the IRS “Targeting” when Eric Holder is the ranking official to choose that prosecutor. So the question I have asked my Congressional representatives is, “What ‘powers’ does the legislative branch really have?” If Congress “oversees” the IRS, and the Justice Department, and the FBI, but can’t even compel them to provide basic information about what they are doing, what power does it have to carry out its Constitutional powers? If it can create the Tax Advocacy Service to oversee the IRS so that it does not abuse taxpayers, but then cannot even defund it or fire its CEO when they do not do their jobs, what “powers” does it have? In effect, through the efforts of the Executive Branch, the “Separation of Powers” is rapidly becoming the “Consolidation of Powers” under one branch. This was further demonstrated by actions (yet to be proven unconstitutional) by the Executive Branch in which the President simply decided that he would implement key provisions of the Dream Act, regardless of the fact that Congress did not vote it into law. As a Citizen, this overreach of power by the Executive Branch, and lack of demonstrable power by the Legislative and Judicial Branches, is more than disconcerting. Is it a Constitutional Crisis? That is still to be determined. 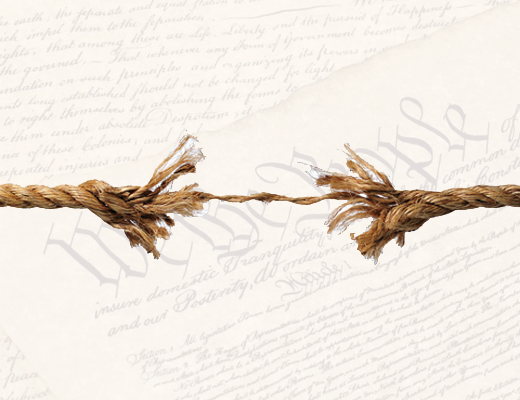 If we cannot find a way to bring our “Separation of Powers” back into balance, it will certainly be a Constitutional Crisis, when the checks and balances provided by the “Separation of Powers” are no longer in play. We should all urge our elected representatives to take action, through the courts or otherwise, to defend and enforce their “Powers” and keep the Executive Branch from becoming a dictatorship–or we will all surely pay a price that none of us wants to pay.